Apple's Worldwide Developer Conference (WWDC) for 2018 is about to get underway tomorrow, and that usually means a plethora of updates on software for iPhones, Macs, Apple TVs, and all the other gear Apple makes. It looks like one new macOS feature just leaked out early. Developer Steve Troughton-Smith spotted that one of the 30-second previews prepared by Apple shows a dark mode for Xcode 10, one of the programming tools available for macOS. The darker Trash icon in the dock suggests that this could be a system-wide feature, though we're going to have to wait until tomorrow to find out for sure. macOS already features an optional dark mode, but it only applies to the dock and menu bar rather than program interfaces. If Xcode 10 has been given a new dark gray look then it's possible that other Apple applications are going to follow suit. Also in the dock on the video preview: an Apple News app. 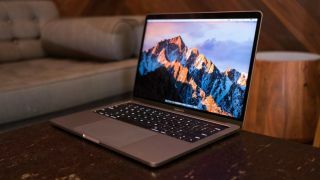 That suggests Apple is going to extend Apple News from iOS to macOS, so you'll be able to keep up with news stories on the topics you're interested in from your laptop or desktop machine as well. We've heard a ton of other rumors about what to expect from the software updates being announced tomorrow – iOS 12, for instance, is said to be getting a phone-to-phone AR capability that lets you enjoy augmented reality with your friends, as well as a digital health check-up tool that makes sure you're not using your phone more than you should be. What we won't get, according to the most recent speculation anyway, is refreshes for Apple's various hardware lines. The main keynote gets underway at at 10am PT, 1pm ET, 6pm BST, and Tuesday 3am AEST if you're in Australia.